Amidst a green expanse strewn with hills stood a group of senior managers, from a leading garment manufacturing company, somewhat unsure but certainly excited. 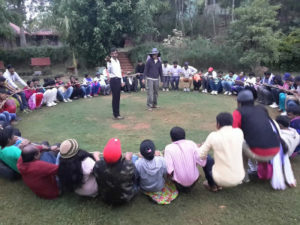 The group was here for ‘Outbound Training’, an experiential learning method, where ‘outbound’ refers to an informal and boundless zone in the midst of nature. As the facilitator of this training, I shared their mood. The excitement was the ruling emotion. However, few were aware of the wave of emotions that was to engulf them in the next two days. In the words of Arnold Bennett: “There can be no knowledge without emotion. To the cognition of the brain must be added the experience of the soul.” Outbound Training stimulates reflection by providing a relaxed and serene environment to the participants, away from the hustle-bustle of everyday life and the routine deadlines. 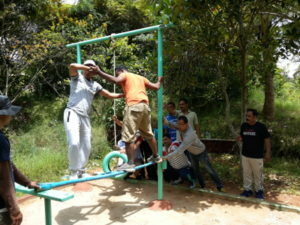 It drives self-exploration as the participants go through a string of experiences from different activities and games. In the two-day residential training programme, participants live with minimum requirements in natural surroundings. They stay in bamboo huts and attend sessions that begin early morning and end late at night. The activities and games help them unwind and recognise their own strengths, as well as those of their peers, connect with each other, and reflect on overcoming workplace challenges. Most of us develop prejudices and mindsets that we hold on to as a result of our experiences and their interpretations. Since experiences often create these mindsets, a new experience can also change them. In Outbound Training, participants usually categorise activities as trivial, difficult or impossible. However, when they see the contrast between their beliefs and actual experiences, it encourages new learning. 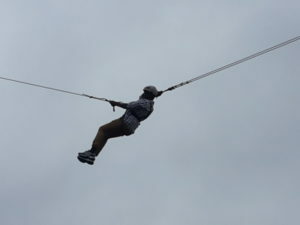 For instance, most participants were reluctant to play the ‘Giant Swing’ game, where your teammates pull on a rope that raises you very high above the ground and then release the cord plummeting you towards the ground. But once they played it, they realised that with repeated trials what seems undoable can be done, a learning that can extend to all areas of their lives. Another game ‘Bazooka’, where participants divided into teams are given the same amount of water to pour into a huge pipe, taught them the importance of efficient team-work for resource management. I can vouch for the intensity and longevity of experiential learning through the process of reflection. In 2011, I was a participant in an Outbound Training, and a lot of what I learnt then became a part of me. It gave me better self-confidence and an ability to overcome fears. I realised its strength for not just changing but transforming participants. Often team leaders in factories are unable to understand the issues, challenges and needs of the workers rendering our efforts towards workforce development less effective. Outbound Training provides an opportunity to address this limitation thus paving the way for better measures of worker well being. Effective worker well being is closely related to the empathy leaders have for their workers. A training that helps them comprehend the needs of workers so that they become committed to improving their situation, then becomes a powerful tool to weave worker well-being into HR policies and systems. As someone working in this field for over 17 years, I know that an empathetic and involved management is often the difference between an effective and weak worker wellbeing initiatives. However, in its totality, the training also aimed to enhance the internal capacities of the management for achieving better business outcomes, and as such, was a win-win. The participants shared their experiences of the training, from calling it an ‘eye opener’ that made them realise their mistakes, to acknowledging that they had forgotten to feel and express gratitude towards their peers. I realised that the training had made an impact. 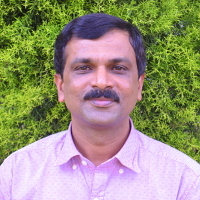 In most cases, I have seen changes in the behavioural pattern of training participants. In this case, too, the management shared the changes they observed in team leaders, such as better bonding with workers, caring for their concerns, and being proactive about initiatives for their health and wellbeing. These changes, having come from within, will most probably stay. The leaders are likely to be guided by the higher empathy levels they now have for workers. This can potentially improve the worker-management relationship, make happy and productive workers, and eventually lead to favourable business outcomes. The boundlessness of training methodology and the ‘here-to-stay’ nature of learnings place Outbound Training a notch above the conventional training methods, and make a strong case for investing in it. They say learning is no spectator sport. They also say all learning has an emotional basis. How far does this hold true? What value addtion does the unconventional training methodology offer?